You are at:Home»Current in Carmel»Carmel Community»Carmel’s property tax increase: How and why did this occur? Carmel’s property tax increase: How and why did this occur? As I reported in the July 26 edition of Current in Carmel, property taxes are going up for some homeowners in Carmel. In October, when the Carmel City Council passed its 2016 budget it included a tax rate of 71.43 cents per $100 for homeowners, only about a penny increase from the 2015 rate of 70.07 cents. But now that the property tax bills have been sent to Carmel mailboxes, people are finding out that the actual rate for 2016 is 83.56 cents per $100, or 19 percent greater than what was originally reported in the news. For a home valued at $300,000, that’s about $400 more a year in city property taxes. The rate went up for two reasons. For one, there was a one-time appeal to the State of Indiana to try to recoup some miscalculated taxes during the annexation of West Clay. The other reason the city property taxes are going up is because the previous Carmel City Council (which saw three councilors lose elections and leave office in January) failed to pass rate cap resolution. Can you explain that one-time appeal? Carmel Mayor Jim Brainard emphasised that the state made this mistake, not the city, and that it represents about 6 cents of the nearly 13 cents per $100 increase. Brainard said this 6 cents will go away next year and so taxes will decrease. According to Department of Local Government Finance, the state, “allows a unit to seek an increase in its maximum levy to pay additional costs for providing services to newly annexed or consolidated areas or for extending governmental services to additional geographic areas or persons. In other words, this appeal is intended to assist units in accommodating growth in land area, growth in population, or consolidation of governments.” This was approved by the state and unanimously approved by the council, but not included in the 71.43 cents per $100 stated in the budget. Brainard said it was based on three years of incorrect tax abatement during the phasing in of the annexation of West Clay. He said Carmel missed out on approximately $4.6 million. “It’s a catching up on the money we should have received,” he said. What’s a rate cap resolution? It’s an ordinance passed by the council that says the city tax rate can’t be higher than stated in the ordinance. So in essence, it could cause the mayor to cut his budget if it’s bigger than the rate passed. For 2016, four councilors sponsored a rate cap resolution at 70.07 cents per $100 of assessed value, which meant no growth in rate. There could, of course, be growth in assessed value. The four councilors who sponsored the resolution were Luci Snyder, Rick Sharp, Eric Seidensticker and Carol Schleif. Sharp ran against Brainard for mayor and lost. Brainard endorsed the opponents of Snyder, Schleif and Seidensticker. Snyder and Seidensticker lost their elections. At the Oct. 19 meeting, Schleif decided at the meeting to take her name off as a sponsor and she would vote against the rate cap resolution. She told me there’s two reasons she did that. One, she thought there needed to be more revenue to allow for infrastructure improvements and, two, she was promised by Mayor Brainard that her constituents in West Clay would finally see further investment in roads and infrastructure in their part of town. Schleif voted against the rate cap and voted for the budget. Snyder also voted for the budget but gave a speech first to preface that her vote was because she lost the election and she wanted to graciously respect the mayor’s choice of budget. Allies of Brainard said that Sharp, Seidensticker and Snyder might have overplayed their hand by suggesting a rate cap with zero increase in rate. They tell me a slight increase might have passed. How does this city rate increase compare to past years? Here are some figures to consider. Were we told that the rate was going to increase? The budget includes a property tax rate at 71.43 cents per $100 of assessed value, an increase from the current rate of 70.07 cents. It was passed 5-2 by the council. The new tax rate amounts to an increase of about $59 per year for a home of about $200,000. Homes at $345,000 or more are already at the property tax cap, so they won’t be affected. Brainard has resisted calling this a tax increase, instead referring to it as a slight adjustment to bring taxes back to where they were in 2013 and actually could end up being lower than they were at that time. Carmel City Council President Rick Sharp, who voted against the budget, said that’s just spin from the mayor, and the bottom line is he promised in the recent mayoral election that no tax increase would be needed. Sharp said the tax rate was set at 52.84 cents when he took office in 2004, raised to 70.07 cents in 2013 and will go to 71.43 cents in 2016. A penny adds up. A homeowner with a $200,000 house will pay $59 more for a total of $1,972 in 2016. Brainard says that taxes inadvertently had decreased in 2014 and 2015 and he is trying to restore them to previous levels. As you can see, the public read in the newspapers that the increase would only be about a penny per $100 of assessed value. It’s actually 13 cents per $100 of assessed value. Sharp said that the mayor wasn’t honest about the tax increase with the public. But Brainard contends that public knew about the tax increase because they saw the size of the budget that was passed. It’s important to note that most cities don’t pass a rate cap resolution so in other cities you just find out the rate when you get your bill in the mail. I spoke with several academic experts who confirmed this with me. 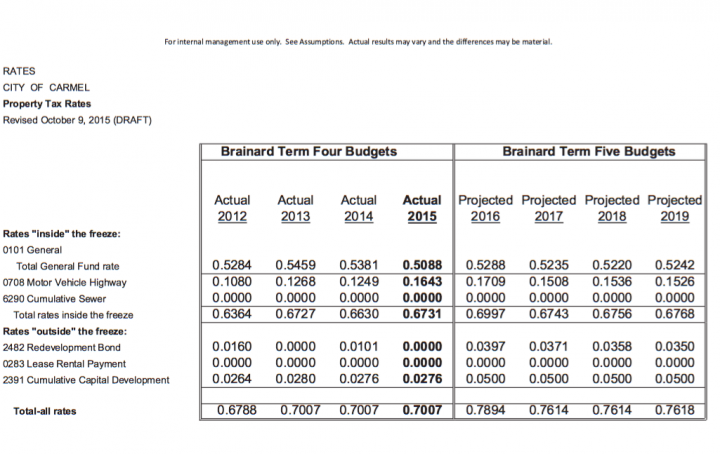 Did Brainard break a campaign promise by raising taxes? Sharp, who ran against Brainard on a platform that he thought the mayor’s policies would lead to a tax increase, said he’s been proven right. He said Brainard promised to not raise taxes. Clearly, my opponent in this election wants to scare you by twisting the numbers and making it appear that you – the taxpayer – is about to experience a tax increase. NOTHING COULD BE FURTHER FROM THE TRUTH. There is no need for a tax increase. Our business tax revenue in our TIF Districts generates more than enough money to retire the debt that has been accrued. Our projections show this and my opponent knows this … he and his extremist followers are choosing to ignore the facts in order to paint a scary picture. This is politics. Nothing more. Brainard told me that he was referring to the special benefits tax, a tax that Sharp kept saying would be enacted if Carmel couldn’t meet its debt obligations due to a lack of revenue from tax increment financing. In fact, Sharp brought up to me a moment in the mayoral debate at the Carmel Clay Public Library in 2015 where Brainard pulled a ten dollar bill out of his pocket to say that a tax increase would only be $10, if anything. I asked Brainard if he broke a campaign promise. “I said we’d continue to have low taxes and we do,” Brainard said. Brainard said the larger budget is necessary for a growing city. So how much is this tax increase going to cost you? It’s hard to say. There are so many factors. For one, this is just the city tax rate. Your overall property tax rate is made of several tax rates, including township, county, schools, library and sometimes others depending on the city. Other parts of the total tax rate have decreased, which means the overall tax rate for Carmel homeowners only increased from $1.9569 per $100 of assessed value in 2015 to $2.0706 per $100 in 2016. County and township property taxes slightly decreased. In addition, assessed value can affect how much you pay. Not only can your rate go up, but your value can go up or down, so that’s another variable. Homes valued over $345,000 are already at a property tax cap set by the state so their rates can’t go up. But, I did some simple math. For example, if your home is valued at $300,000 and there’s no change in assessed value. For just the city rate portion alone, not your total rate, you’d pay $400 more in 2016. But, you’re not actually paying $400 more because other parts of the rate went down. Does everyone know about this tax increase? If you’re already at the property tax cap, you wouldn’t know. And I’m told from many people that when they pay their monthly mortgage, the taxes are already included so they don’t really notice how much it increases. I talked to a lot of homeowners and there are so many things that can affect your payments that people don’t alway notice every single part. People don’t always study their bill to see their assessed value, city rate, total rate, etc. Some people told me they had not even looked at the bill at all and the envelope was unopened. How does assessed value play into this? A lot of people wanted me to look into assessed value as an angle for my story. Carmel is a hot destination to move to and homes are selling for far more than they were originally purchased for, so it’s obvious that assessed values are increasing. It’s a tricky issue though. Some people want their homes to increase in value because that means they can sell it one day and make a profit. People often complain about nearby development or eyesores that cause decreases in property value, so, yes, some want their values to go up. But there are people who are never planning to move. They are retired and on a fixed income and now they see their property tax bill increase and increase due to the increase in assessed value. They dispute that their home is actually worth the assessment and whether they could actually sell for that price, but that’s a moot point for many since they don’t want to move at all. This is a fascinating debate and one that I hope to explore in depth in the future. Plus it’s hard to explore that topic because there is a philosophical divide about whether increases in assessed value are good or bad. Are property taxes going to continue to increase? This is an analysis and commentary by Adam Aasen. Carol seriously. Remember the Mayor’s promises on the bailout? Remember how he reneged? Remember The CT fiasco where someone illegally removed records? Remember him trying to weasel out of any responsibility. Remember his constant habit of trying to have it both ways. I’m disappointed and surprised. I hope you’re right and you FINALLY see the investment that has been repeatedly promised to West Clay. After giving the Mayor a quarter billion dollars on January 18 I would certainly hope there is enough money. Exactly 1 week prior to the election Jeff Worrell released this video of the Mayor statinf TIF came in $32 million higher than expected. How does this fit the above scenario? First most taxpayers can’t go to a Budget meeting if they are working at it starts at 5:00PM. And putting in the paper in a small print section so no can see it only gives him a legal statement ” We followed the rules the public was made aware. Anyone with common sense knew taxes going up. and Jim Brainard lied while campaigning. He will ask for more money.